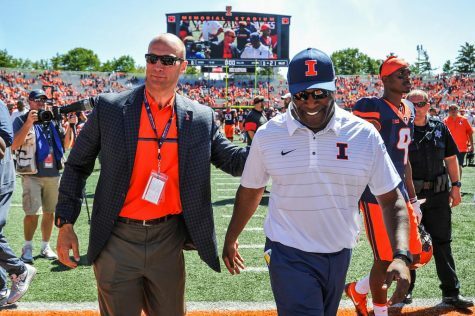 Illinois head coach Lovie Smith walks down the sideline at Memorial Stadium on Saturday, October 8. Smith will start spring practices almost two months earlier this year. 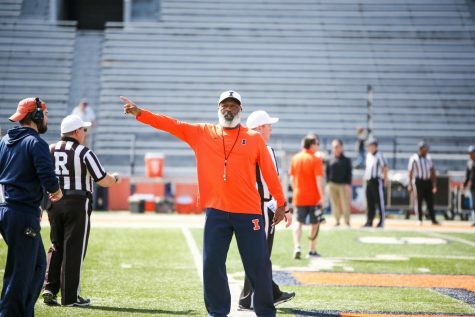 Illinois football head coach Lovie Smith and his team will begin the first of 15 spring practices Tuesday. There are several major storylines surrounding Smith and his team entering spring ball. Here are the top five. Linebackers coach Tim McGarigle left the program last week to become the Defensive Quality Control coach for the Green Bay Packers. Smith said he expects the position to be filled by the start of spring ball. 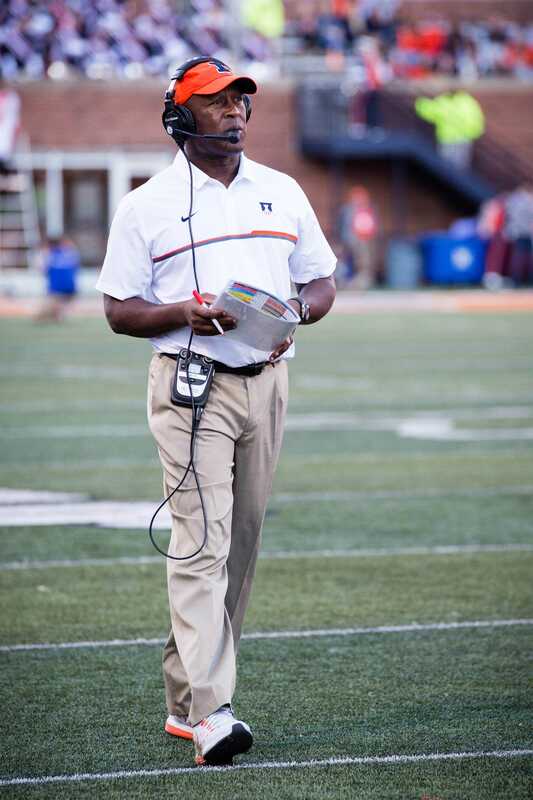 The Illini also parted ways with Director of Player Personnel Josh Sternquist. Smith brought Sternquist to the University last April. “We went through a cycle, and we felt like we needed to make a move,” Smith said. 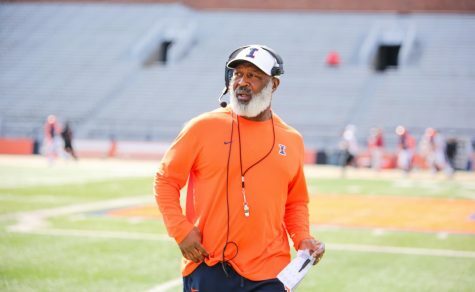 The Illini delayed the start of spring practice last season following the dismissal of head coach Bill Cubit by Director of Athletics Josh Whitman. 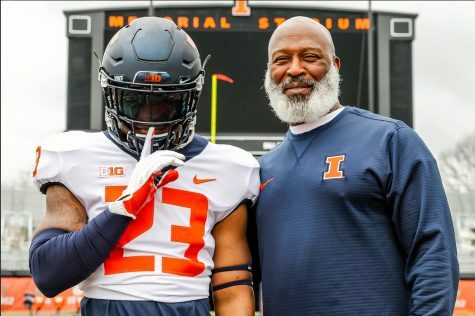 Illinois started last season’s spring practices April 1. Smith said there are benefits with recruiting and finding a routine with starting spring practice nearly two months earlier. 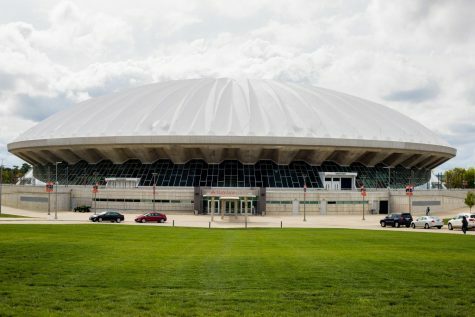 Illinois welcomes the public to its spring practice on March 4, in lieu of a spring game. 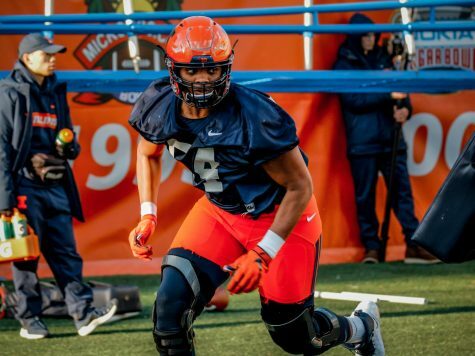 In a familiar tone to press conferences as the headman of the Chicago Bears, Smith announced junior Chayce Crouch is currently the starter for next season. Behind Crouch, who is currently injured and will be limited in spring practice, is Jeff George Jr.
Dual-threat quarterback and Hutchinson Community College’s Dwayne Lawson is expected by many to be the starter against Ball State on Sept. 2. But, Lawson has not signed his Letter of Intent and will likely not enroll at the University until this summer. Running back Dre Brown and wide receiver Mike Dudek have each been sidelined the past two seasons with a pair of ACL injuries. “They’re making a lot of progress,” Smith said. Dudek will be a redshirt sophomore in 2017. 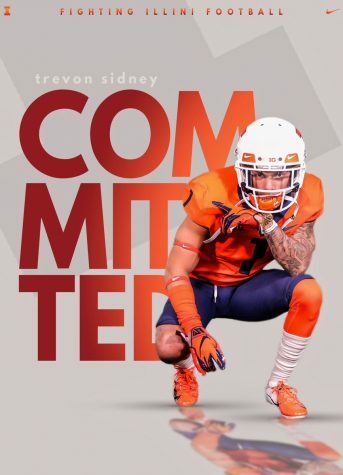 Brown will be a redshirt freshman. Dudek had 76 catches for 1,038 yards and six touchdowns as a freshman in 2014. 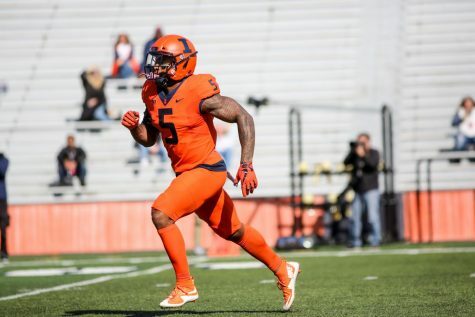 Illinois needs both players healthy this season following the transfers of wide receiver Desmond Cain and running back Ke’Shawn Vaughn. 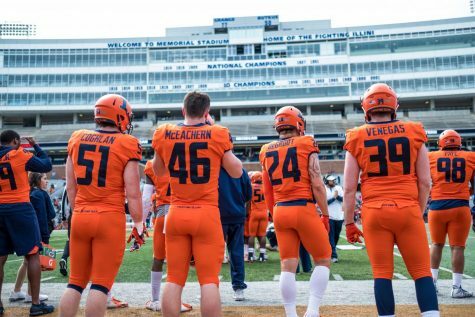 The Illini graduated four captains after last season. Smith expects senior running back Kendrick Foster to step into one of those positions, beginning during spring ball. He called Foster an ambassador for the University and said the senior helps in recruiting.